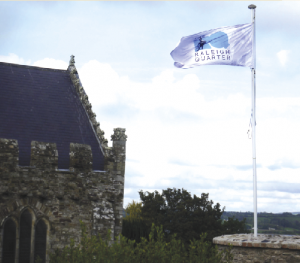 Flying the flag for the ‘Raleigh Quarter’ near St Mary’s Collegiate Church, Youghal. In late September 2013 a number of flags appeared on the towers of the longest town walls in the Republic of Ireland. The flags carry the image of a typical seventeenth-century English gent, the tip of his sword to the ground, hand on hip, head turned, balanced neatly by the plume of his hat. The white flags fly over the town of Youghal and decorate what was formerly known as the ‘historic quarter’. This site is home to the thirteenth-century St Mary’s Collegiate Church and town walls, Richard Boyle’s former home and gardens and Myrtle Grove, the fifteenth-century warden house for the one-time College of Youghal. The historic quarter has been home and temporary residence to an array of highly significant figures in the power play between Ireland and England from the late sixteenth century to the late seventeenth century. From the last of the earls of Desmond in the Munster wars to the Richard Boyle dynasty to George Carew, Murrough ‘the burner’ O’Brien, Roger Boyle, earl of Orrery, Oliver Cromwell and a host of others, the pathways in and around the historic quarter are haunted by the tumult of wars and industry, cultural, political and religious colonisation and assimilation. Few sites in Ireland have retained the aura of the past so well, particularly from that period. The buildings are, for the most part, remarkably intact. 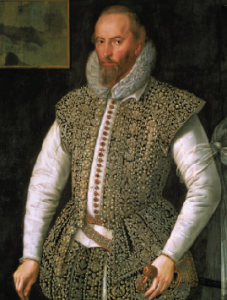 There is one name missing from the above list of historic figures with connections to the site—Sir Walter Raleigh. Raleigh has a peculiar and sustaining influence over the history of Youghal, most of it fuelled by folklore, popular storytelling and, of late, a misguided attempt to use his name for a heritage/tourism drive. Raleigh may well have a broad, wry smile as his image on the new flags cuts a superior and lofty elevation above a town that brought him so little and to which he gave so little in return. Youghal Town Council, with €4,000 worth of funding from Fáilte Ireland, has renamed the historic quarter as the ‘Raleigh Quarter’. The costs have been attributed to ‘branding and launching’. It is hoped that the identification of this extraordinary site with a marketable name will draw tourists to Youghal. There are issues with this move; some far-reaching effects for heritage will result. But first, why has this happened? Why Walter Raleigh? 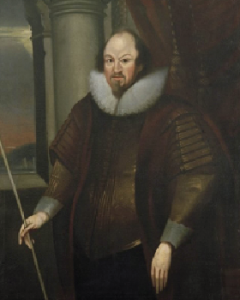 Raleigh spent very little time in Youghal, despite owning in excess of 40,000 acres of Blackwater Valley lands that he acquired after the 1579 Desmond rebellion. He is recorded as mayor of Youghal in 1588 and 1589 but never acted in the role. He was too busy policing areas of possible invasion by the doomed Spanish Armada. In fact, Raleigh was always busy doing something else other than thinking about Youghal. He obsessed about the ‘New World’ and Guyana and mused over mathematics; in his time in Munster, Lismore was his home, not Youghal. His plantation scheme was a financial disaster, leading some of his Devon and Somerset families to pack their bags and return home. He threatened to charge the displaced Irish with treason if they refused to work in the construction of the plantations. His timber business was a miserable failure, clearing the land of trees and cutting down 7,500 of them in just two months before allowing them to rot on the River Blackwater’s banks. He added absolutely nothing to Youghal’s infrastructure and very little to its economy. As an adventurer in Ireland he was a reprehensible snob and killer. His action at Smerwick and the slaughtering of over 600 Spanish and Italian soldiers, who were stripped naked and left to rot on the beach, in 1580 was condemned across Europe. His self-professed abhorrence of Catholics was often a guise for piracy where the plundering of Spanish ships was a purely economic concern rather than a religious one, and he didn’t baulk at trading slaves with them. His false ‘gentlemanly conduct in war’ was offset by the hiring of executioners to poison Irish rebels, and his use of Youghal ships—under English command—in the pretence of being Irish, so that they could trade in Spain, showed the depth of his hypocrisy. All of that, I hear you protest, seems appropriate for the age. It is not Raleigh the man that galls one when his flag flies in the face of history but the lie created around him. Raleigh has become a ‘fun figure of folklore’ in Youghal. His name has been attached to everything from festivals to the main hotel to children’s attractions. His figure is re-enacted to greet tour buses on the quayside. Raleigh’s name has endured because of the great myth that he planted the first potato in Ireland in his garden in Youghal. For generations, Youghal has fed on this blight on historical fact as if it would provide release from a tourist famine. It carries that poisoned seed for all historical fact—the ‘unique selling point’, out of which grow the roots of myth and legend. Thankfully, some excellent research, such as J.G. Hawkes and J. Francisco-Ortega’s ‘The potato in Spain during the late 16th century’ and William H. McNeill’s ‘The introduction of the potato into Ireland’, has concluded that the Spanish brought the patata to Europe from South America as early as the 1530s, almost five decades before Raleigh set foot in Ireland. Spanish ships traded along the south coast of Ireland throughout those decades, and it is more probable that Raleigh found potatoes growing in Youghal rather than planting them. The myth that he planted the first potato there cannot be dismissed as insignificant. The plant’s history in Ireland is well known: from creating an improved diet and population growth to bolstering the economy—so much so that the nation’s dependency on it was vividly exposed in the Great Famine. Never let historical facts get in the way of a good heritage/tourism story, however. 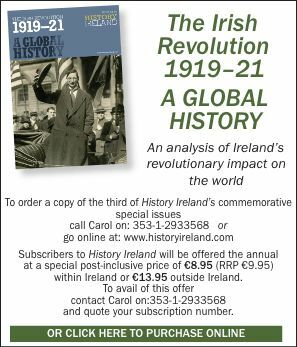 As a Youghal councillor once remarked profoundly, ‘History is in the past’. But is it? If Raleigh’s image flies over Youghal, isn’t that history in the present? Won’t visitors demand to know who he was and what he did in Youghal? And, more pertinently, will they be told the truth? What about the motivated heritage tourist who will know more about Raleigh than anyone in Fáilte Ireland or Youghal Town Council? Will he or she be found musing in bewilderment at the irony of it all? ‘. . . use all the beastly behaviour that may be, they oppress all men, they spoil as well the subject, as the enemy; they steal, they are cruel and bloody, full of revenge, and delighting in deadly execution, licentious, swearers and blasphemers, common ravishers of women, and murderers of children’. Raleigh, of course, agreed, and both were apologists for a scorched-earth policy whereby inducing famine by slaughtering livestock was the most effective way to suppress Irish rebellion and plant the green shoots of English civility. Michael Twomey teaches tourism, heritage and local history at East Cork Further Education Centre. His Irish heart! English blood: early modern Youghal will be published shortly by the History Press Ireland.